CP/CENT/INT/09. 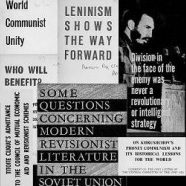 Pamphlets and cuttings from 1964-1966, re Sino-Soviet dispute, with a strong emphasis from the Chinese side (including Albania) on attacking 'Khrushchovite revisionism', and from the Soviet side calling for unity in the international Communist movement. Includes miscellaneous issues and cuttings from Comment, Hsinhua (esp. on Palmiro Togliatti's posthumously published thoughts), Peking review and Soviet news. Issue nos. 1-6, 8 (April-July 1964), followed by two unnumbered issues for September 1964 and June 1965. Articles by leading members of the CPGB include: no. 1: Fight for the unity of the international Communist movement / R. Palme Dutt; no. 2: Peaceful transition or Chinese blind alley? / J.R. Campbell; no. 3: Peaceful coexistence and the class struggle / George Matthews; no. 4: The fight for disarmament / William Wainwright; no. 5: The CP of China's attitude to other parties / John Mahon; no. 6: The international Communist movement and national liberation / Jack Woodis; no. 8: The international Communist movement / joint statement of the CPs of Australia and NZ; June 5th 1965: The Labour government, and the Communist Party / John Gollan; September 26 1964: Togliatti's memorandum "Unity and the international Communist movement. Articles on: "New polemic on the philosophical front"; "Cadres must take part in labour to carry on the revolution"; "Firm support for Indonesian people's struggle against "Malaysia"; "Beware of this dirty deal". In Comment, the Italian CP's Foreign bulletin and World Marxist review, including introduction by Luigi Longo. A translation of an article by Renmin Ribao (People's daily) and Hongqi (Red flag) published by the Hsinhua New Agency. Includes leading article "For the unity of the international workers' and Communist movement"; followed by a typescript document "Quotations used in report to E.C. May 1965, on international Communist movement". Two issues from late July, including "Two letters from the CC of the CPSU to the CC of CP Japan" and "Nikita Khrushchov visits Poland for anniversary celebrations. Articles on: "Seven letters exchanged between central committees of CPC and CPSU"; "The nation celebrates"; "Lessons for them Brazilian coup"; "Highest unclimbed peak onquered". Full title: Seven letters exchanged between the central committees of the Communist Party of China and the Communist Party of the Soviet Union. Published by the Foreign Languages Press, Peking. Published by the Foreign Languages Press, Peking.